Teachers and supporters rally on Monday, Jan. 14, the first day of the teachers strike in Los Angeles. The school district and the union have come to a deal after almost two years of negotiations. Some teachers expressed frustration, saying the deal didn't go far enough, while others said they were relieved. "I'm pretty excited," said Jennifer Liebe-Zelazny, a fourth-grade teacher at Alta Loma Elementary School. "Nobody got everything, but everybody got something." Teachers went on strike on Monday, Jan. 14, after about two years of contract negotiations and over a year of working without a contract. As teachers took to the streets, talks went on hold. The school district and the union resumed negotiations on Thursday, ahead of the holiday weekend. The city's mayor, Eric Garcetti, facilitated negotiations, including a 21-hour session that ended in the early morning hours on Tuesday. "For a city that embraced the idea that public education matters — that children matter, that teachers matter — today is a day full of good news," Garcetti said Tuesday. 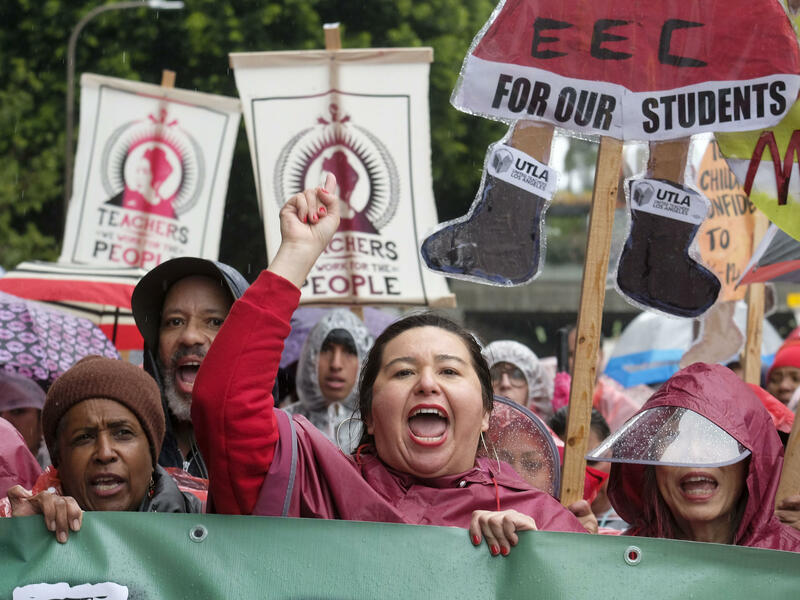 UTLA — which represents more than 30,000 teachers and school support staff — was striking for smaller classes, and more nurses, counselors and librarians in schools. District leaders previously said they just didn't have the money to pay for that. The week before the strike, Austin Beutner, the city's schools superintendent, visited the state Capitol in Sacramento to ask for more funding for the district. In many press events since, he's emphasized that 90 percent of the district's funding comes from the state of California. At a news conference announcing the tentative deal, Caputo-Pearl and Beutner said it would increase teacher salaries, reduce class sizes and put more support staff in schools. Caputo-Pearl also mentioned that the agreement touched on special education, standardized testing and keeping charter schools accountable. Read a summary of the agreement posted by the school district here. Los Angeles is home to the country's second-largest school district and serves almost a half-million students. Most schools remained open throughout the strike, staffed by administrators, volunteers and substitute teachers. However, attendance was low, with less than a third of the students coming to school on some days, according to the district. That's a problem because district funding from the state is linked to attendance. Each day of the strike meant an estimated net loss of about $10 to $15 million dollars.